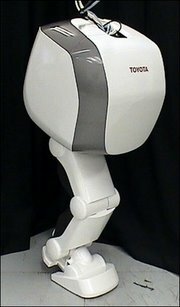 Toyota has announced that they have developed a robot leg that can jump. The leg is 1 meter tall and can jump up to 4 cm (1.6 inches) in the air. This marvel of acrobatics is made possible by an active joint in the toe in addition to the regular knee and hip. One day they will make two legs so they can have a walking humanoid. The addition of the bending foot will also allow a robot better control when walking on uneven surfaces. A Toyota Motor Corp. spokeswoman reportedly said,"It was a difficult step for robots." She could have been a bit wittier. Maybe, "It's a big leap for robots." Or, "That's one small step for a robot leg but one big leap for robot-kind." Or maybe even, "This really gives us a leg up on our competition." Soemtimes I just crack myself up. Toyota has been working on robots for awhile. Their trumpet-playing humanoid Partner travels the world showing off his skills. LOVE that you have a blog about robots! i'll be back! A hopping robot *yawn*. Can't these guys come up with something a bit more useful?